* Situation - What was the situation you / your previous employer faced? * Task - What tasks were involved in that situation? * Action - What actions did you take? * Results - What were the results of those actions? 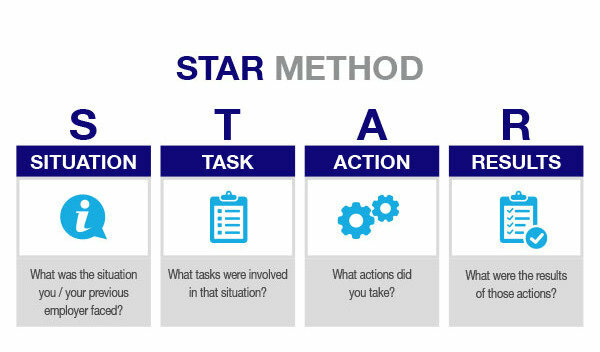 Let's provide some context as to why interviewers like candidates to answer questions using the STAR method as a template. If asked about this in an interview, the candidate might say, "WE increased sales by $10 million in a single year." There's that word many interviewers hate... the dreaded "WE." Amongst very seasoned interviewers, the first question that pops into mind is: "Who exactly is 'we' ?" As an interviewer, I really don't care if "we" accomplished X. I want to know what YOU did. What was your role, your contribution to achieving X? That's the useful stuff. When a candidate answers resume-based questions in the STAR format, it gets the interviewer the precise facts he or she needs to make a factually informed hiring decision. It significantly reduces the number of follow-up questions an interviewer would typically ask to get the same answers. While the STAR method benefits the interviewer, it also benefits the candidate who actually has strong career experiences that on the surface seem similar to other candidates. For example, let's assume we have two candidates - Candidate A and Candidate B. Both candidates list on their resumes that they "grew sales by $10 million in 1 year." On the surface, both candidates seem equal. Without the STAR method, both candidates would verbally confirm that "we increased sales by $10M that year." But with the STAR method, Candidate A might be forced to admit that he was part of a sales team that generated $10 million, and his role was to make sure everyone reported their daily sales statistics... and of course, this was generously translated into "we" growing sales by $10 million. Meanwhile, perhaps Candidate B went out and landed 10 new accounts and generated $1 million in new revenue from each of those accounts. Now, he did have a sales support team to set up product demos and handle logistics and scheduling. So from his point of view, "we" generated $10 million in sales. Notice how with the STAR method, it becomes much easier to tell who did what. As a result, use of the STAR method favors two distinct audiences. It favors interviewers who want candidates to get to the point. It also favors very strong candidates because it allows one to communicate impressive accomplishments in a highly specific, and thus very believable, way. The only downside of the STAR method is: if you're trying to "fake" your accomplishments and stretch the truth (beyond merely casting your experiences in a favorable light), it will be very hard to hide one's exaggerations using the STAR method. Of course, this downside for the secretly weak candidate is an upside for the strong candidate. An alternative to the STAR method is a way of answering resume questions that I developed called the PARADE method. I find the PARADE method, while a little harder to remember, is extremely thorough in eliciting the key facts behind a candidate's career accomplishments. Between the STAR and PARADE methods, I strongly favor the PARADE method because it helps candidates stand out in a clearer way.